Plastic water bowls are not ok! Besides the water taking on toxins from plastic, they are ugly. Why not have something decorative and fun – and amusing to your cat! Whitney Smith is a great potter in Oakland, California. 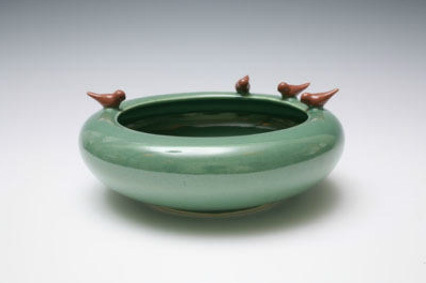 We have one of these birdie encrusted hand thrown bowls on our kitchen floor for the cats! She does other pieces with birds, like cupcake stands, and plates. We have several of everything she makes with birds! Adorable! Our favorite litter box isn’t a litter box! We wrote about this a few years ago. The other day a customer wrote to say that her cat sprays urine while in the litter box. 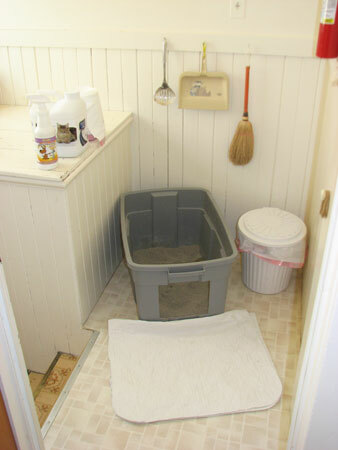 We decided it was time to resurrect the photo of what we use for litter boxes. When our cats started getting really old and unable to squat to urinate their pee would fly over the walls of standard pet shop litter boxes. So we bought two plastic storage boxes and cut out an opening (you can cut the opening low for cats with poor mobility as we did here or higher for younger cats). The sides are very high which prevents urine from hitting the floor. And the box’s depth is great, the cat get step inside, easily turn around and get in a good position to do their business. The high sides are also great for cats who like to dig their way to China and who scatter litter everywhere. These storage boxes will save your walls, floors, and your sanity! The other newsletter you should be reading – it could save your cat’s life! At least once a week we are asked what cat food we endorse. And just about every time we say that we like one – bingo – there’s a recall or we learn the company was sold to a corporate giant, or the ingredients changed. For example, Susan recently told us that Science Diet will be adding PLASTIC to their food. Seriously? If you are a long time reader of The Cat Faeries Companion you know that plastic is a cancer cell’s best friend and is otherwise unsafe and toxic. Susan Thixton is a crusader for truth in cat and dog food labeling as well as she tirelessly stays on top of harmful ingredients, GMO’s, and cat and dog food recalls. You MUST subscribe to her Truth About Pet Food newsletter to stay informed. The world of cat food changes all the time, we need someone like Susan to keep us posted! Introducing Cat Faeries latest family member: Coco! We found Coco on the wonderful www.petfinder.com and we are so glad we did! She’s a darling! And while they don’t know it yet, Cat Faeries CFO (Chief Feline Officer) Madeline Silver Belle and Coco will be best friends, ruling Cat Faeries with the touch of a paw or two! 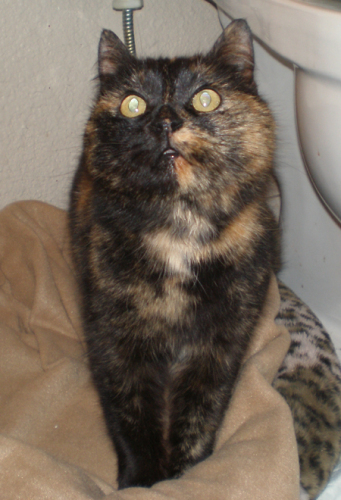 In February Coco was found by the lovely Michelle who lives in San Jose and who feeds several cat colonies. One day at one of the colonies she saw a cat sitting on a fence, crying. She saw the new cat for 4 days. Because Coco’s ear was not tipped she knew that she was not feral, but had been dumped by some creep. Michelle took her home and named the elegant cat after Coco Chanel. Fast forward to September 2012. 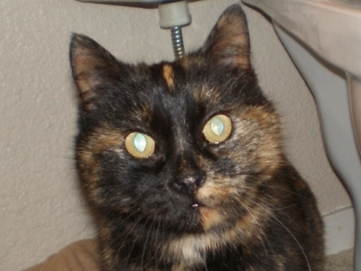 We lost our beloved 18 year old Torti September 4th. And for the first time in countless years there was only one cat in the house! So the search began to open our door and hearts to another cat (or more?). Pet Finder is great fun for what we call Kitty Photo Dating! You can search for the species you are interested in and the breed. She arrived yesterday and once she comes out of the closet we’ll take photos. For now, here are her Pet Finder pix. I recently read some interesting articles on veterinary websites about how cats communicate using body language. How a cat is positioning its tail, back, ears, eyes and other parts of its body can tell a lot about its emotional state and intentions. Changes in body language over time can also indicate medical problems that need attention. Take a look at these articles, you’ll learn a lot about cat body language. It’s pretty interesting to then watch how your own cats communicate to each other and to you. Once again, food for our animal friends has been contaminated by harmful additives. This time it’s cat treats. Over 1,000 cartons of “Catswell Brand VitaKitty Chicken Breast with Flaxseed and Vitamins” have been recalled by the manufacturer because of contamination by propylene glycol. While propylene glycol has been approved by the FDA as an additive for dog and human food, it is banned by the FDA for cat food because it can cause Heinz body anemia, a serious disease for cats that causes the destruction of red blood cells. Symptoms include fever, weakness, loss of appetite, reddish brown urine, skin discoloration and pale lips, mouth, or gums. This is a continuing and serious problem for cats, dogs and our other animal friends – harmful contaminates in pet food which are introduced somewhere in the supply chain. Often these chemicals are being added overseas, where some pet food companies source their ingredients.